As more multinational business executives and IT managers consider embracing managed cloud service offerings, many are wondering how the service provider landscape is evolving -- and where providers plan to differentiate their capabilities. Much of the initial market insight focused on the key emerging trends, but now we're starting to see more detailed analysis. A new market study by Infonetics Research details operator plans for managed cloud services -- including their strategies and approaches to offering services, how services will be delivered now and in the future, and top applications of each type of cloud service including: Software as a Service (SaaS), Infrastructure as a Service (IaaS), and Platform as a Service (PaaS). Their latest worldwide study resulted in the report entitled "Cloud Service Strategies: Global Service Provider Survey," where Infonetics analysts interviewed 20 incumbent telco, competitive, data center operators, and cable operators that offer cloud services -- now, or they plan to by 2013. "Service providers around the world have embraced the cloud concept in earnest and are heavily investing in new services and service delivery platforms based on their particular areas of expertise. Internet content providers are leading with SaaS, data center and co-location operators are adding IaaS to their product portfolios and investing in additional infrastructure facilities, and traditional telcos are building on their existing networks and adding a range of services," said Sam Barnett, Infonetics Research's directing analyst for data center and cloud. 70 percent of respondent operators are investing in cloud services in anticipation of demand. 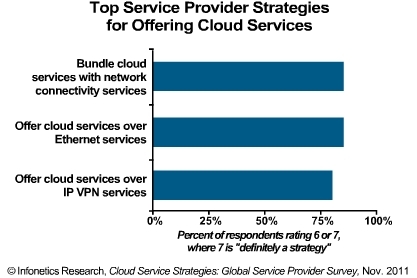 The top operator strategies for offering cloud services are bundling cloud services with network connectivity services and offering cloud services over Ethernet or IP VPN services. Many of the smaller data center providers participating in Infonetics' survey plan to keep their business uncomplicated by moving from simple collocation support offerings to IaaS via the addition of computer and storage hardware, rather than getting into the complexities of offering OS software platforms. 95 percent of respondent operators offer IaaS now. More sophisticated offerings like platform as a service, or PaaS (formed by the addition of server operating systems such as Windows, Linux, and Unix) and software as a service, or SaaS (such as e-mail and security services offered by telcos and ICPs like Google) are currently offered by fewer operators, but will grow significantly by 2013. All the Infonetics survey respondents are knowledgeable purchase decision-makers at service providers in EMEA (Europe, Middle East, Africa), Asia Pacific, and North America that together represent 20 percent of the world's telecom carrier revenue and 21 percent of the world's telecommunications service provider capital expenditure (capex).